Product Description: A pre-filter is the primary layer of filtration that collects large particles before they reach the H.E.P.A. filter. Eliminating these larger particles (dust and hair) extends the life of your H.E.P.A. filter. Occasional vacuuming of the exterior of the unit will help extend life of the filters. Frequent pre-filter changes will also prolong the H.E.P.A. filter life. Cleaning Area: The Austin HealthMate will filter up to 700 square feet. 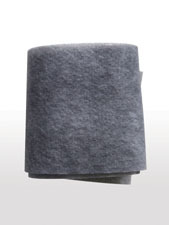 Filter Media: The Permafilt pre-filter is made up of a cotton/polyester blend. Filter Change: Pre-filter under normal conditions should last up to five years. It is designed to be vacuumed occasionally from the exterior of the unit. This will help extend the life of the H.E.P.A. filter. Return Policy: In the event the pre-filter isn�t working out for you, you may return it within 2 weeks of purchase. You must contact our Customer Service Department for a return authorization number. Complete the return form that was sent with your invoice. Be sure to include any materials you received, such as the instruction booklet, as well as any parts that may have come with the pre-filter. All pre-filters must be put in a separate box so that there are no shipping labels or writing on the original packaging. We suggest you insure the package and all return shipping charges are your responsibility. Upon its return, the unit will be inspected, and if it is in resellable condition we will credit you back less a 10% restocking fee. In the event the pre-filter is damaged or defective, please save all packing material and contact our Customer Service Department immediately for further instructions.